BELIZE CITY, Tues. Apr. 7, 2015–This year’s edition of the 87th Annual Holy Saturday Cross Country Cycling Classic climaxed with a dramatic sprint that was successfully orchestrated and executed by Belizean-American Justin Williams, 25, who went on to claim the hard-fought victory just after midday last Saturday, April 4. Justin and his brother and teammate, Corey Williams, 21, formed part of an early breakaway group of 7 riders who separated themselves from the peloton just outside Hattieville, while the race was on its way to San Ignacio Town, Cayo. That group momentarily merged with a chase group of 4 just a few miles before the race reached the Belmopan junction, and the lead group of 11 reached the halfway point in San Ignacio in an impressive 2 hours and 35 minutes, just four minutes off the record that was set in 2009 by Costa Rican Marcos Antonio Rios. On the return journey near Teakettle Village, the group – which included the likes of Shane Vasquez of Team Western Spirits; American Scotty Weiss of Team Starlight; Erwin Middleton of Benny’s Megabytes; Richard Santiago of Team Digicell; Justin and Corey Williams of Team Bel-Cal; Mexican Yahir Jimenez Godinez of Team Cancun; David Henderson, Jr. of Team Smart Zoom; Leroy Cassasola of Team Santino’s; along with Peter Choto and Aiden Juan of Team C-Ray – coordinated to establish a five-minute lead ahead of a chase group of 12 riders led by American Guy East of Team Santino’s. That 12-member chase group was later swallowed up by the main peloton at around Mile 46. The lead group, however, were determined not to be reeled in; but by the time the grueling 140-mile race reached La Democracia at Mile 31, the group of leaders had dwindled to 5. Among them were Belizeans, David Henderson, Jr. and the Williams brothers, Corey and Justin; American Scottie Weiss; and Mexican Zahir Jimenez Godinez. As it came down to the wire, Justin – who is a trained sprinter – managed to beat out Weiss, to walk away with the coveted title, finishing in 5 hours, 55 minutes and 39 seconds. 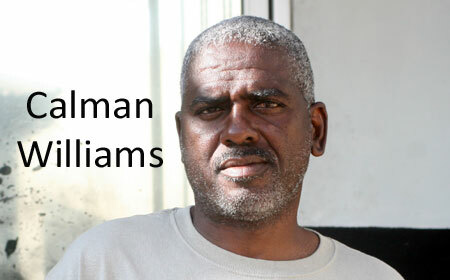 Today, Amandala spoke with the winner, who is the elder son of veteran Belizean cyclist, Calman Williams, and he described the significance of defying the odds to win the garland for his native country. “I saw the break going up the road and I just decided to go across; and in my mind, I thought that if I attack, the foreigners are going to have to chase me; and then when they catch me, hopefully they use too much energy to get across, and I’ll be a bit more fresh, because in the breakaway, you can ride a bit more smoothly and save more energy,” he said, as he recounted his strategy in the initial part of the race. Justin conceded though, that his win might not have been possible if it wasn’t for the help of his brother who did the work of a domestique in order give him a chance to win. “While going into Cayo, he [Corey] said, ‘Just sit, we’ll bring this one in; just sit, I’m gonna work as much as I can to take you as far as I can.’ And at the end of the day, he was strong enough to make it all the way home, and I’m proud of him for that. But we always work together, so it’s nothing new to us,” Justin declared. Justin and Corey are professional riders of Belizean parentage who reside in Los Angeles, California, USA, and thus, that fact has become a bone in the throat of certain locals – mainly on social media – who have questioned the winner’s allegiance. Justin, who is a professional cyclist, told us that he will be back for the National Road Championships in June of this year, and that he hopes to win the jersey and ride for Belize in the 2016 Commonwealth Olympics. He also indicated that his lifelong dream is to wear the Belize-flagged jersey in some big UCI races, one of which is scheduled to be held in Europe this August. Williams won an assortment of prizes and trophies which included $6,000.00 cash, along with the Elston Kerr Cup, the Jeffrey O’Brien Memorial Trophy, the Altreith Smith and Ludrick Smith Memorial Trophies, as well as a painting, a return ticket on Maya Island Air, a $400.00 shopping spree from the Mirage Group, a weekend stay for two at Ramon’s Village in San Pedro valued at $1,000.00, and a case of Travellers’ Coconut Rum. He also took home bonus prizes, including $10,000.00 from Massy United Insurance; $5,000.00 from the Ministry of Education Youth and Sports; $250.00 cash from LC Distributors, plus a plot of land from the Ministry of Natural Resources and Agriculture. Corey – who started coming to Belize when he was about 3 years old – told us that although the race was long and hard, they (he and Justin) rode with all their heart. “We went [in the breakaway] a little early – that wasn’t in the game plan. The game plan was to wait; but when we did that last year, we didn’t do well; so this year, we caught the break and we waited for other riders to come over to us; and nobody else came, so we went all the way to the finish line,” he explained. Another important player who contributed to Justin’s victory is his father and mentor, veteran Belizean cyclist, Calman Williams, 51, who coached along Justin and Corey as they rode the race. Calman mentioned that he was quite satisfied with the result, because it shows that they have perfected what he taught them over the years, in terms of determination and sacrifice. “They grew up watching me racing, and they got up one day and said, ‘Dad, I want to ride too.’ So, I said that if you want to do it, there are certain things you have to do, and certain things you have to give up; so I saw that they were serious, and I put them on a bike, and they took it over from there,” Williams cited. 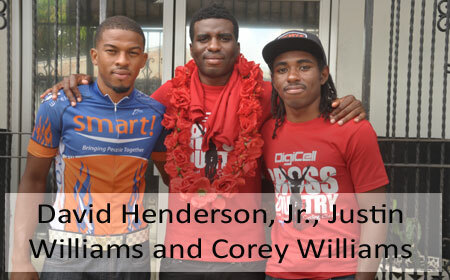 We also caught up with David Henderson, Jr., 24, who placed third, ahead of Zahir Godinez, who was fourth, and Corey Williams, who finished fifth. Henderson, who has been a cyclist for over 7 years – 4 of which have been in the elite category – reflected on the race, and spoke about the final moments. Henderson expressed that his commendable performance was based on the condition of his body and the knowledge that his team, his sponsors, and his family were behind him 100%. Sixth place went to Byron Pope of Benny’s Megabytes, seventh to Chris Harkey, eighth to Manuel Rodas, ninth to Jose Choto, and tenth to Colombian Jose Robles. Other notable Belizean finishers are Leroy Cassasola, 16th; Shane Vasquez, 20th; Joel Borland, 22nd; Darnell Barrow, 23rd; Geovanni “Froggy” Leslie, 25th; Nissan Arana, 30th; Quinton Hamiton, 31st; Oscar Quiroz, 32nd; Ron Vasquez, 33rd; brothers Gregory and Geovanni Lovell, 35th and 37th, respectively; Michael Lewis, who finished 38th in his final Cross Country; and Kenroy “Smokes” Gladden, 39th.